The surgeon makes a 5 to 7 inch (12.5 to 17.5 centimeters) cut in the upper right part of your belly, just below your ribs. The area is opened up so the surgeon can view the gallbladder and separate it from the other organs. The surgeon cuts the bile duct and blood vessels that lead to the gallbladder. 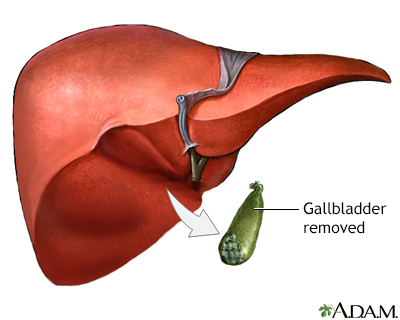 The gallbladder is gently lifted out and removed from your body. An x-ray called a cholangiogram may be done during your surgery. 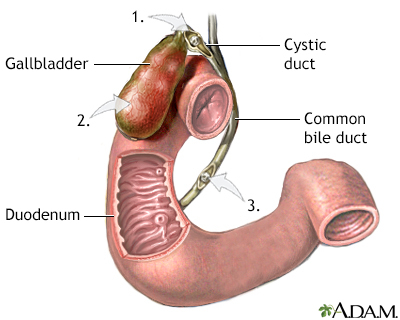 To do this test, dye is injected into your common bile duct and an x-ray is taken. The dye helps find stones that may be outside your gallbladder. You may need this surgery if you have pain or other symptoms from gallstones. 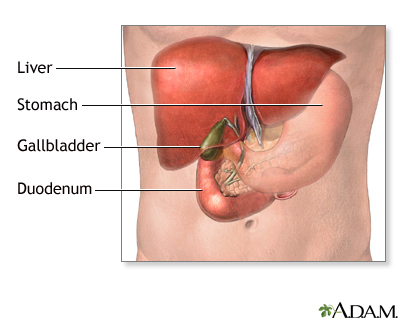 You may also need surgery if your gallbladder is not working normally. The most common way to remove the gallbladder is by using a medical instrument called a laparoscope (laparoscopic cholecystectomy). 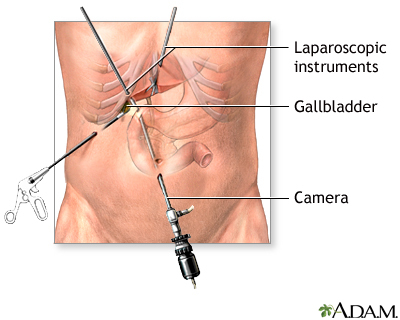 Open gallbladder surgery is used when laparoscopic surgery cannot be done safely. 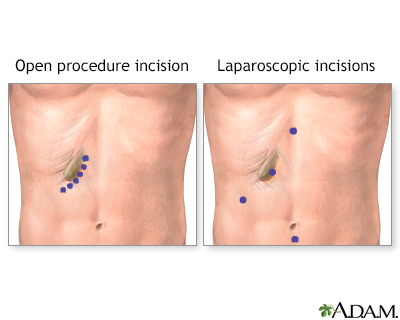 In some cases, the surgeon needs to switch to an open surgery if laparoscopic surgery cannot be successfully continued. You may be asked to stop taking aspirin, ibuprofen (Advil, Motrin), vitamin E, warfarin (Coumadin), and any other drugs that put you at a higher risk of bleeding during surgery. You'll be told when to arrive at the hospital. You may be asked to breathe into a device called an incentive spirometer. This helps keep your lungs working well so that you do not get pneumonia. The nurse will help you sit up in bed, hang your legs over the side, and then stand up and start to walk. At first, you will receive fluids into your vein through an intravenous (IV) tube. Soon after, you will be asked to start drinking liquids and eating foods. You will be able to shower while you are still in the hospital. You may be asked to wear pressure stockings on your legs to help prevent a blood clot from forming. If there were problems during your surgery, or if you have bleeding, a lot of pain, or a fever, you may need to stay in the hospital longer. Your doctor or nurses will tell you how to care for yourself after you leave the hospital. Most people recover quickly and have good results from this procedure. Rocha FG, Clanton J. Technique of cholecystectomy: open and minimally invasive. In: Jarnagin WR, ed. Blumgart's Surgery of the Liver, Biliary Tract, and Pancreas. 6th ed. Philadelphia, PA: Elsevier; 2017:chap 35. This is a CT scan of the upper abdomen showing cholecystitis (gall stones). Cholelithiasis can be seen on a cholangiogram. Radio-opaque dye is used to enhance the x-ray. Multiple stones are present in the gallbladder (PTCA).